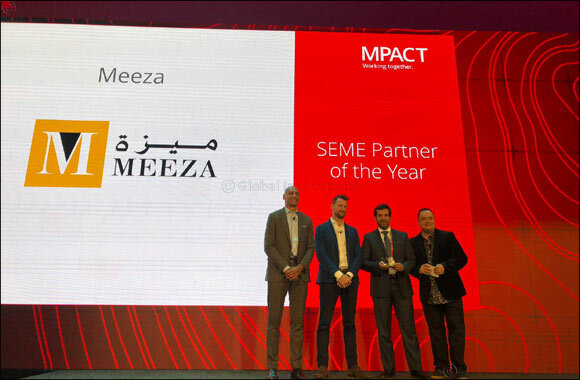 Doha, December 4, 2018 – With great pride, MEEZA, Qatar’s prominent end-to-end Managed IT Services & Solutions Provider, takes pleasure in announcing that it has been awarded as the “SEME Partner of the Year 2018” for Southern Europe and Middle-East Region at the McAfee MPOWER Cybersecurity Summit, which was held on 28 November 2018, in Rome, Italy. MEEZA was recognized for having the highest contribution in MSP business for the year 2018 by establishing new verticals, markets and adding new solutions to address next generation SOC requirements and offer successful Managed Security Services to multiple clients throughout the region. This recognition is another testament to MEEZA as an organization that provides service excellence. MPOWER Cybersecurity Summit offers fellow security experts a networking platform to strategize, network, and learn about the newest and most innovative ways to ward off advanced cyber-attacks. MPOWER provides a unique opportunity for attendees to learn directly from other McAfee users and discover how they maintain the highest standards of security while reducing costs, streamlining processes, and driving efficiencies in the daily administration of their networks and systems. Alongside, Cybersecurity thought leaders share the latest insights from our rapidly and ever-shifting industry. Through its Security Operations Centre ( SOC ), MEEZA offers comprehensive IT Security Solutions, which includes proactive monitoring and response to potential security risks, in addition to provide the highest level of security against cyber-attacks and address ongoing security threats. MEEZA, a Qatar Foundation joint venture, is an established end-to-end Managed IT Services & Solutions Provider based in Qatar that aims to accelerate the growth of the country through the provision of world-class Managed IT Services and Solutions. MEEZA’s offerings include Data Centre Services, Cloud Services, IT Security Services and Smart Cities Management and Solutions.